Architect Don Dimster integrated a new roof deck and custom furnishings into Chris and Marjorie Rice’s 1960s Buff, Straub and Hensman home in Los Angeles. In its previous state, the roof trapped and pooled water. The house opens to the rear deck, which the original architects projected into the setback to maximize the outdoor space. All the doors are from Western Window Systems. As in his own home in Venice, Dimster added a clear railingto the roof deck, so nothing would obstruct the view. He also designed the sun shades. Dimster replaced and extended the original stair; the new version is in steel and glass and spans three floors. “The treads are open because we wanted to have as much light come down as possible,” says Dimster. Dimster added new, two-story-tall beams to support the weight of the glass box topping the stair. “We were missing a grand outdoor space—that’s where the roof deck comes into play,” Dimster says. The old kitchen became a bedroom that doubles as a study. The team matched and continued the 1960s-era red oak floor into the living room, which gained an entire wall of new sliders from Western Window Systems. “We wanted to preserve the original intent of the house wherever we could,” Dimster notes. Marjorie takes to a Brumby rocking chair on the deck off the bedroom, which is privatized by a forest of bamboo. In the dining room, artworks by Alan Davie (at left) and Martin Bradley join a Norman Foster dining table. Marjorie Rice, who worked for NBC News in London before moving to Los Angeles, tackled house hunting with a professional’s intensity. “I was looking at about 40 places a week,” she says. Nothing fit the bill until she and her husband, Chris Rice, an agent at William Morris Endeavor (WME), came across a 1,600-square-foot post-and-beam high in the Hollywood Hills—exactly where they wanted to live. “Easy” may have been a miscalculation, but Venice, California–based architect Don Dimster, having created an innovative rooftop for his own house a few years ago (see Dwell, June 2014), was up to the challenge. He and general contractor Franklin Pineda collaborated with the Rices to tailor their new home to fit their lifestyle. The remodel included a larger kitchen, a fourth bedroom, and an upstairs bath, as well as the new roof deck. Both Rices are dedicated foodies and Chris is an avid cook (sous vide machine, slow cooker, multiple wine fridges), so a contemporary kitchen with plenty of storage was paramount. By co-opting a front deck as interior space, Dimster was able to relocate the kitchen adjacent to the living room—making one large fluid space, ideal for entertaining. With white Ikea cabinetry, skylights, and glass windows that look onto the potted bamboo of a modernist sliver of a winter garden, the serene addition serves its practical function and also makes the living room feel exponentially larger. Marjorie trekked to more than 20 stone yards before settling on the river-washed quartzite for the countertops. Dimster further customized the living-dining experience by recessing electric shades in the railing of a balcony that, accessed by a triple series of new sliding-glass doors, runs along the side of the house with the hill view. With the flick of a switch, the Rices can ration the amount of light they get during the day, and the amount of privacy they want at night. 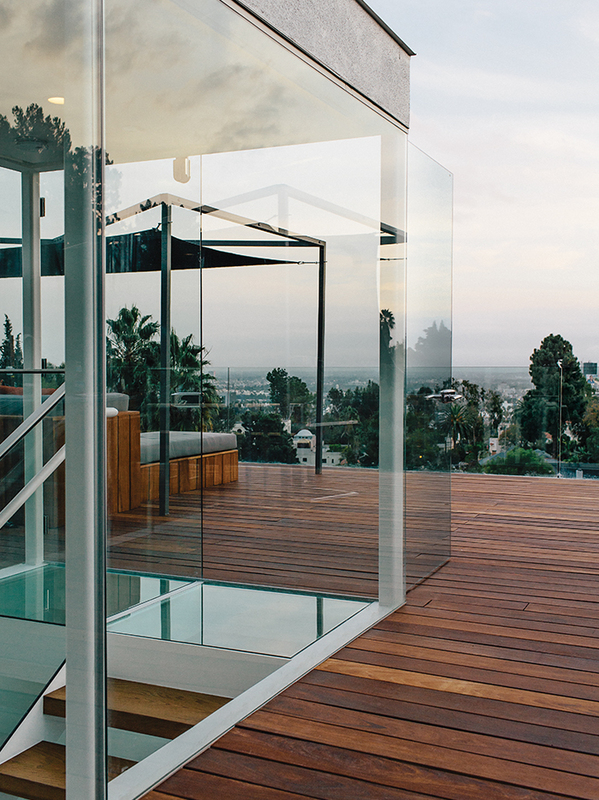 The real magic of the renovation may be the roof deck, which added 1,217 square feet of living space; Dimster’s dramatic glass-cased stairway is the drumroll that precedes it. After a switchback landing made of double-layer tempered glass, the oak treads rise to the ipe wood deck, unrecognizable from its former water-logged incarnation. Now a grown-ups’ playground, the roof hosts a bar with an integrated grill and sink, a fire pit, and a dining table, all of which Dimster designed incorporating the quartzite from the kitchen counters and the ipe from the deck. He also designed the teak seating. For days when the Southern California sun is brutal, shade sails can easily be moved and manipulated—and if that doesn’t cool things down sufficiently, a quick dousing under the shower in the corner will do the job.